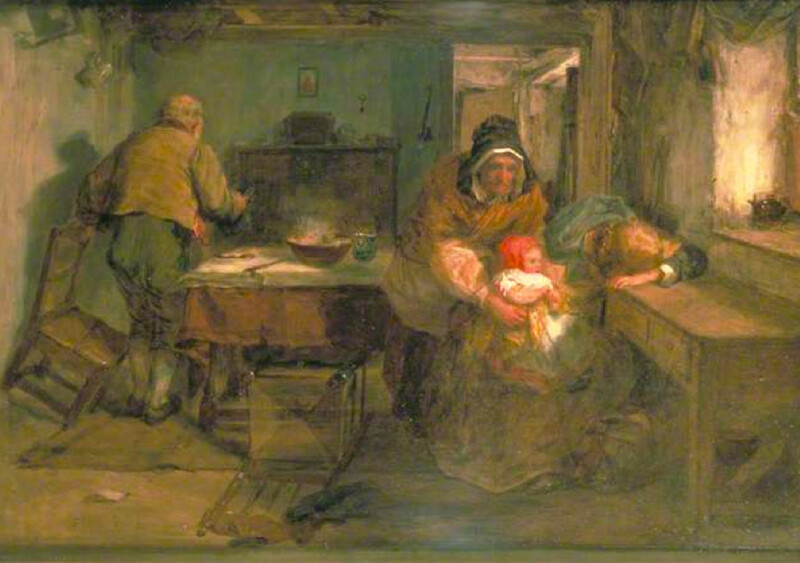 In this touching depiction on the "Fallen Woman" theme, a daughter has returned to the family home and, at the far right, is hiding her face on her arm in shame. To the left, her father, who has risen from his chair, turns to leave the room, probably in anger, and not looking at his daughter at all. But her mother bends down to hold the granddaughter. Light shines through the window illuminating the innocent little tot. Her red bonnet could be taken as a sign of her own mother's fleshly "sin" or even reflect on the grandfather's anger, but it is perhaps better seen as a sign of robust hope for the future. The room shows that this is a poor family, so the little girl will be an extra burden and affect her own mother's earning prospects. Their lives have been thoroughly overturned, like the chair in the foreground. But who knows what comfort the child will bring to the elderly couple? This might seem too positive a reading, but it is clear that the emphasis is on the grandmother's encircling arms, one of which also catches the light.